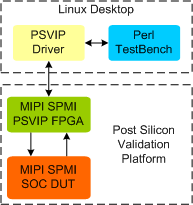 MIPI SPMI Post Silicon Validation IP (MIPI SPMI Protocol Analyzer And Exerciser) provides a smart way to post silicon validation of the MIPI SPMI component of a SOC. MIPI SPMI Post Silicon Validation IP provides an smart way to post silicon validation of the MIPI SPMI bi-directional two-wire bus. The SmartDV's MIPI SPMI Post Silicon Validation IP is fully compliant with version 2.0 MIPI Alliance specification for System Power Management Interface and provides the following features. Supports 1.0 and 2.0 MIPI SPMI Specification. Supports Full MIPI SPMI Master and Slave functionality. Supports all topologies as per the MIPI SPMI specification. Supports multiple slaves and multiple masters. Compares read data with expected results. Supports following master bus connecting on bus. Supports all types of SPMI commands. Supports ACK/NACK generation as per 2.0 specs. Supports various kind of Master and Slave errors generation. Supports master and slave arbitration.